A hunger strike started by workers of the Lobinsky biochemical plant has sparked nation-wide interest. 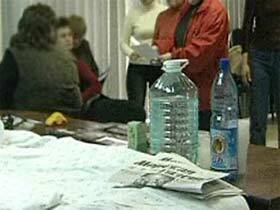 18 employees of the factory, located in Russia’s Sverdlovsk oblast, have refused to eat since April 28th, in an attempt to convince management to dole out back pay to over 500 factory workers, according to the Agency of Political News (RUS). Of the 18 employees who started the hunger strike, six have been hospitalized, and four were forced to stop when the act exacerbated chronic illnesses they have. Now, it appears that a labor relations committee of Russia’s Public Chamber, which advises lawmakers, is preparing to step in. In sum, the company owes some 19 million rubles ($796, 800 or €515,900) in back pay, for work done as far back as last year. The Rossiyskaya Gazeta newspaper writes (RUS) that the average monthly income at the plant is 7,000 rubles, and that each worker is owed around 28,000 rubles. The plant’s management did not respond to the protest until the hunger strike was underway for 12 days. Workers received a “letter of guarantee” that they would be paid by June 10th. The striking employees, however, said they had never heard of the directors who signed the letter, and said the document held little authority. They then continued their protest. The factory, which produces industrial alcohol, has filed for bankruptcy. Management said they were looking for a new owner to take over the operation, and would pay back workers once production resumed. The previous owner, oligarch Pavel Fedulev, is currently serving a 9-year sentence for shady business dealings. Some media have reported that the Lobinsky plant was once Russia’s biggest producer of raw materials used to make counterfeit vodka. The Lobinsky protest is the third labor dispute in the the Sverdlovsk oblast in recent months, according to Itar-Tass (RUS). Thus, 107 miners working for Sevuralboksitrud (a part of the mammoth RUSAL aluminum company) went on strike from March 26th to April 4th, demanding a raise in wages. And from April 13th to 19th, 66 workers of the same mine announced a hunger strike with similar demands.